A peduncle (see the etymology) is a flowerstalk which does not terminate in a flower, but rather in one or more pedicels, which are individual flowerstalks. The picture at the left shows Sinningia cooperi. There are three pedicels branching from the indicated peduncle. 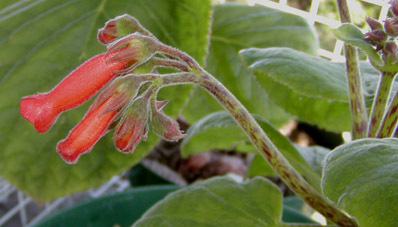 Some Sinningias whose stems terminate in a bunch of flowers have no obvious peduncles; the pedicels appear to emerge directly from the node at the top of the stem. Sinningia leucotricha is a good example. In other species, such as Sinningia lineata in this picture, a long peduncle develops from the terminal vegetative node. Note that the distinctive streaks which give lineata its name are found on the peduncle and pedicels as well as on the stems and petioles. 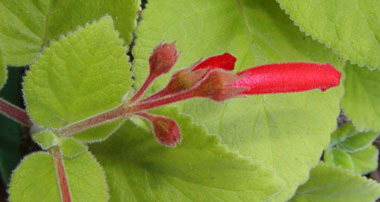 This picture shows the inflorescence of a hybrid, S. reitzii x cardinalis. 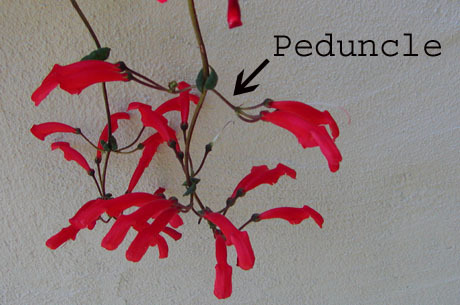 This plant inherits the peduncle from S. reitzii. A good view of a plant with no peduncles can be seen on the S. reitzii x leucotricha page. S. sp. 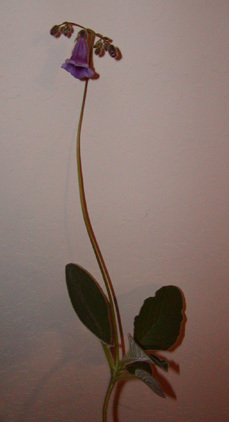 "Ibitioca" has an 8-inch [20-cm] vertical peduncle, holding the flowers well above the rest of the plant. But the peduncle champion of the genus is S. aghensis, seen in this picture, with a foot-tall [30-cm] peduncle on steriods.